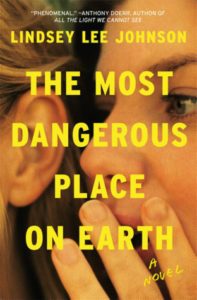 One buzzy book this winter was The Most Dangerous Place On Earth by Lindsey Lee Johnson. It’s about a high school in Mill Valley in Marin County, CA, and the very privileged kids who go there. When the book opens, the kids are in eighth grade, and one of them makes a very passionate pronouncement of love to another one. His letter was made public by the recipient, and after the relentless teasing and bullying that ensued, he jumped off the Golden Gate Bridge. Three years later, the kids are juniors and still dealing with the ramifications of the suicide. Each chapter basically focuses on a different character, and by the end, the reader has a pretty good sense of the whole group, as well as some of their teachers. For the most part, the kids are privileged, entitled, indifferent and spoiled, with little respect for their teachers or even each other. There are overachievers (intense ballerinas and academic stars) as well as hippies, drug dealers, misogynistic athletes and thugs. Their parents are either neglectful or cloying. Johnson does manage to show other sides of these kids, eventually, but in the end it’s hard to find a redeeming person in the whole book. Overall, it was pretty superficial. I kind of wonder what the author’s point was. To make us all despondent over the fate of humanity, if these kids represent our future? To try to get to the heart of teenagers? To shame us into better parenting? I’m not sure. I’d read more by Lindsey Lee Johnson just because of her writing, but this was a bit of a disappointment. I listened to The Most Dangerous Place On Earth on audio. It was narrated by veteran narrator Cassandra Campbell. She did an excellent job with the voices, differentiating them for each kid and sounding as natural with the boys as she did with the girls, which isn’t always the case with narration. She’s precise and easy to listen to, and and she moved the story along nicely. It’s funny – I just looked up books that she has narrated and many of them are sitting on my bookshelf. I know I’ve listened to other Cassandra Campbell performances but I can’t remember which they were. Others seemed to have enjoyed The Most Dangerous Place On Earth more than I did. If you read it and liked it, I’d love to hear why.